Bernice and Tony O’Connell planted their Geographe vineyard in 1997 on a hilly, picturesque 40 hectare property which, in a previous life, had been a blue gum plantation. They envisaged a quiet, idyllic, holiday home which produced a ”few grapes” for some experimental home winemaking. It was a part time venture initially with both still working full time in Perth, Tony at CSIRO and Bernice in TAFE. As time went on the few grapes quickly grew to ten acres, with initial planting of Shiraz, Cabernet Sauvignon, Chardonnay and Zinfandel later expanded to include Muscat, Durif and Riesling. The location of our wine venture, Mandalay Road, lead to the design of our label which depicts a story held to be true in Burmese folklore. The King of the time, King Mindon, considered his royal city of Amarapura to be located in his mind in the wrong place. In 1857, he had this city transported on the back of elephants to a new position at the foot of Mandalay Hill. He named his re-located city, Mandalay. 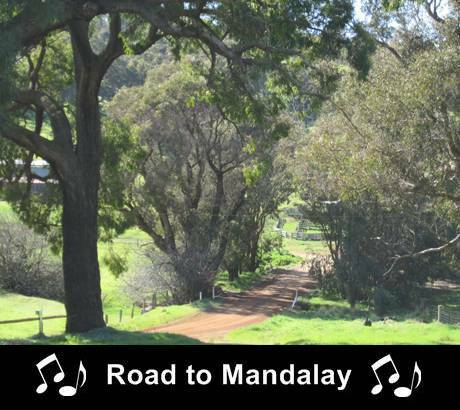 Mandalay Road vineyard is in a picturesque setting, nestled into the valley of the South Preston River. This location has a unique climate, with very cold winter temperatures and cool nights in summer. These conditions encourage an extended ripening period which produces fruit with an intense flavour profile. This is a family, hands on vineyard with Bernice and Tony completing most of the work with help at busy times. Crop loads are kept low and production is a mere few hundred cases per year. The wines are all from a single vineyard, with the emphasis on quality and fruit flavour which truly expresses the vineyard and its location. There is a small, rustic cellar door on the property and we invite you to come off the beaten track and visit us and taste our award winning wines. (See location page for details). You can also buy through our secure online shop. Or join our Mandalay Cluband receive 25% off the price of a six pack of wines of your choice, delivered four times a year with free delivery in WA. Additionally, Mandalay Club Members also receive this discount for any wines purchased online. To keep in touch with our latest news and specials, join our regular newsletter.